Microsoft has released Office productivity suite in two formats: Office 2013 and Office 365. While both provide access to usual Office programs like Word, PowerPoint, Excel and so on – they do differ on additional features, usage rights and most importantly price. For starters, Office 2013 is the next version of traditional Office 2010 product. While Office 365 is all together new offering featuring Office products along with internet enabled services like Skype and SkyDrive. 1. Basics – Microsoft Office 2013 is the usual download-able software that you can install on your PC or Mac and use various programs like Word, Access, Excel, PowerPoint. While Office 365 contains Office applications along with web enabled services like SkyDrive allowing seamless integration. 2. Editions – Office 2013 is available in 3 editions: Office Home & Student 2013, Office Home & Business 2013 and Office Professional 2013. Buying Microsoft Office 2013 gives you access to latest version of Office programs like: Word, Excel, PowerPoint, OneNote. Programs differ based on Office edition you chose. While Office 365 offered in two packages: Office 365 Home Premium and Office 365 Small Business Premium. It includes: Word, Excel, PowerPoint, and Outlook, plus OneNote, Access, and Publisher for Windows PCs along with SkyDrive, Office on Demand cloud services and free Skype minutes. 3. 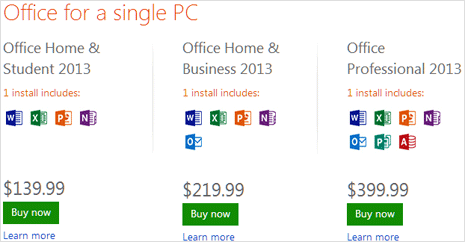 Usage & install – Microsoft Office 2013 software can be installed on only one PC for home use. While Office 365 can be installed on up to 5 PCs or Macs in one household. 4. Buying rights – Microsoft Office 2013 can be purchased through one time upfront payment and thus provide perpetual (lifetime) usage rights. While Office 365 can be bought only through month or annual subscription and offer automatic upgrade rights. 5. Price – Microsoft Office 2013 price is between: 139.99 and 399.99 (US). Office 2013 suite one install price details: Office Home & Student 2013 ($139.99), Office Home & Business 2013 ($219.99) and Office Professional 2013 ($399.99). You can also buy individual Office programs like Word separately for $109.99 approx. While Office 365 has $99.99 per year and $9.99 per month pricing subscription. You can renew it monthly or yearly depending on your current subscription. Answer to this question is strictly based on your requirements. If you are happy with current Office 2010 programs and want to upgrade to new version of Office – then go for Microsoft Office 2013. However, if you have extensive online Word processing requirements along with integrated file storage at SkyDrive – then starting of with monthly Office 365 subscription is a wise decision. If you like this: you can always upgrade Office 365 to the yearly plan. 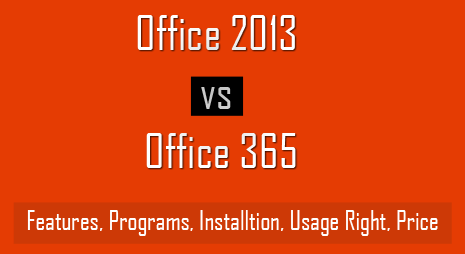 If you do not like it, then buying traditional Office 2013 will be a better option. 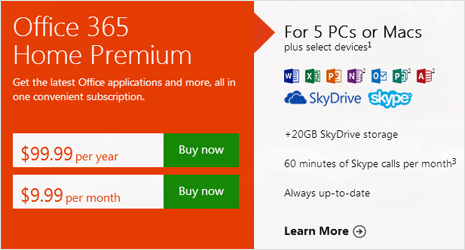 So try before you buy – there is free on month trial on offer at office.microsoft.com website. I have a “signature” for MS Office 365 (Plan 1) and another for Office 365 Small Business. Are these signatures overtopping one to another? Since my interest are the Office software (Word, Excel, Power Point and Outlook, can I give up one of them? Office 365 inforces Microsoft credibility in the cloud world, but the company is facing very aggressive competitors: Google Drive is free, with un unlimitted storage, and can be linked to your Gmail account… I think next years will be hard for Microsoft!